Last May, over 100 people walked, ran, swam, jogged, rowed, arm cycled, wheeled and more as part of Miles for MS, our accessible distance challenge. Bron rowed the length of Lake Bala in Wales every day in May. I was diagnosed with MS in 1996, in my mid-20s. I’ve had a whole range of symptoms over the years, but the ones I now live with on a daily basis are fatigue, left side weakness and both of my hands have numb fingertips. I have always been an intermittent exerciser. I began training with weights aged 13 and always tried to maintain this weight training. I’m convinced that these isolation weight-bearing exercises helped my recovery from my biggest relapses. Getting into running kept my legs moving; although at times I was so weak and unbalanced I couldn’t walk more than two steps, I’ve always been strong-willed and forced myself to just keep going. I then discovered Nordic walking and found a great alternative to running, which provided built-in ‘balance’ poles. I also enjoy gym classes because the buzz I find to be positive and uplifting, and I try to do pilates, which has really helped with my core strength. I think this aspect of exercise is so important for my future disease management. Finally, I discovered enjoyment in the challenge of indoor rowing. I love being able to test myself, time myself and achieve more. 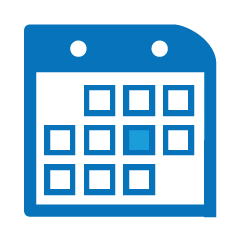 I signed up to Miles for MS because I use the MS Trust website as my go-to source of information for MS and I was seeking a charity challenge that I would be capable of. When I saw that I could complete whatever distance I wanted, via whatever method I wanted, that really appealed. I decided to try rowing on an indoor rowing machine for my Miles for MS challenge. I looked around for a body of water that I could use as my virtual rowing venue and I decided on Lake Bala, the largest natural lake in Wales, which I remember visiting as a child. It turns out my Welsh ancestors originate from villages around Lake Bala and some of my distant relatives continue living in that area. I decided to virtually row the length of Lake Bala every day. I travelled 5.6km every day - primarily indoor rowing, but if there was no machine available, by walking. My husband and friends helped on days when I was unable to summon the energy, but I enjoyed the challenge of completing the daily distance. I actually felt like my strength increased, plus I got some long overdue cardio workouts. I find exercise a real positive in my life. When I am really struggling to do what I enjoy I can encounter feelings of sadness at the loss, but I am constantly looking for what I’m able to do rather that dwelling on what I can no longer do. I was diagnosed with MS about eight years ago after feeling something wasn’t quite right for some time. My main symptoms are fatigue, pain, anxiety, stiffness, pins and needles and weakness, particularly in my legs. I wanted to take part in the Miles for MS challenge because I think the MS Trust is amazing. 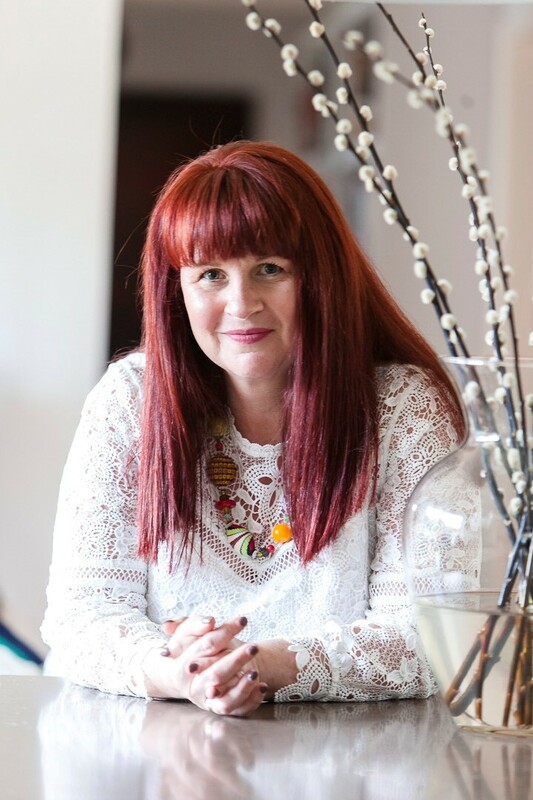 When I was first diagnosed, the MS Trust was who I turned to, to gather all the information I could and I have turned to them on numerous occasions since, when starting a new DMD or with changes to my MS. 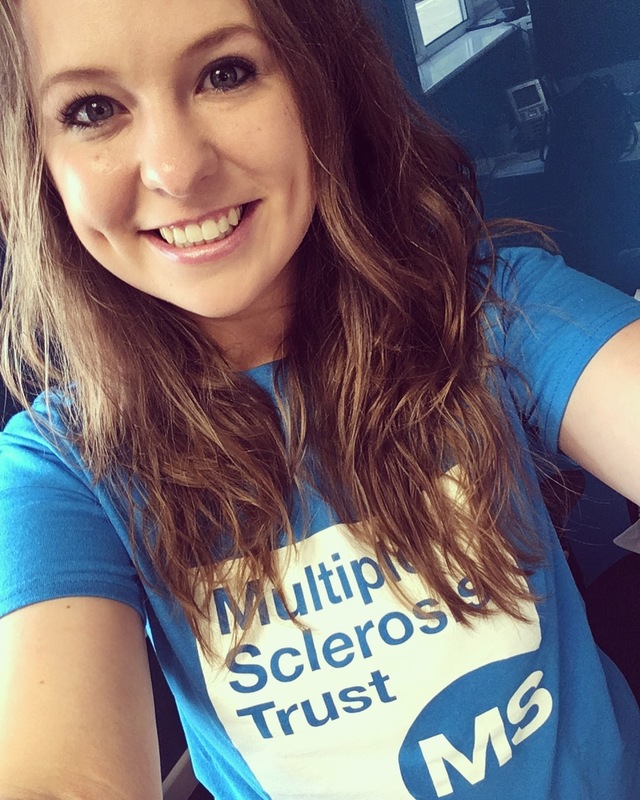 Recently I have had the opportunity to write some short poems to raise MS awareness and in doing so and speaking to people in other countries, I realised just how lucky we are to have an organisation like the MS Trust in this country. 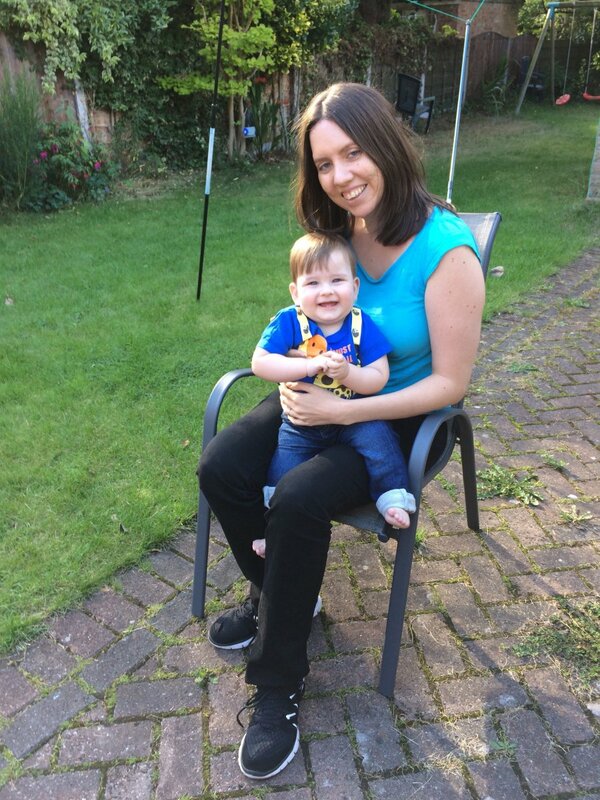 When I saw Miles for MS, I jumped at the chance to create my own challenge which would personally be very challenging but hopefully achievable and raise money for the MS Trust. About a year ago, I had a bad flare up and a severe relapse in relatively quick succession which made life difficult. When my symptoms worsened and I developed new symptoms, in my legs in particular, I didn’t think I would be able to do a lot of the things I used to. The stiffness and weakness made it very difficult to walk more than 20 metres unaided, I was veering off to the left and my balance was poor. I spoke to my MS specialist nurse who referred me to neuro-physio where I learned a variety of strength, balance and stretch exercises which I now do daily. The improvements to my ability to balance have been remarkable and my wellbeing is generally better. I still have significant problems walking far but the distance I am able to walk in one go has improved massively. I set myself a personal challenge of walking five miles in dedicated Miles for MS walks across the month of May. The reason I chose walking is because I used to really enjoy my walks. I have a beautiful baby boy and with this challenge I wanted to try and walk further independently so I can do more with him, especially now he’s becoming more active! The challenge went really well. I pushed myself a little too hard at the beginning so I had a few sleepless nights with the pain but after that I paced myself. By the end of May, I walked more than I ever dreamed would be possible and doubled my original goal. My advice to others diagnosed with MS is to remember that you’re not alone. You will have to make adjustments but try and stay positive because you can do this! MS may limit what you can do but it will not limit who you are. I was diagnosed with MS in March of this year after a year of experiencing all sorts of funny things, these things I now know to be called relapses. My symptoms vary, but the main ones are altered sensations from my waist down caused by inflammations on my spinal cord, plus the ‘lovely’ MS hug and fatigue. I wanted to take part in Miles for MS to raise awareness of MS (it is not something to be ashamed of), raise money for the MS Trust (who do so much in supporting people with MS) and to give myself a morale boost (to prove I can still achieve something and that life isn’t over!). My challenge was to walk 100 miles across the month and it went really well. On good days I racked up some extra miles so that on bad days I could rest. So many people offered to keep me company on my walks, so often I didn’t even notice I was doing it! I chose this challenge to try and take a positive approach to my diagnosis - I’m really fortunate to be in the position I am in and taking part in this challenge and achieving a goal has really helped me realise this. When you have MS, keeping active can be a real morale boost and it feels good to be able to achieve something - no matter how big or small. My advice to somebody who’s just been diagnosed with MS is don’t be ashamed to feel sad or angry for a while. Then have a strong drink (!) and look at all the positives in your life. When I saw this challenge I thought ‘Great! This is something I can now do to help raise money!” I was diagnosed with secondary progressive MS in June 2017, and before my diagnosis I did a number of runs for charity. But due to problems with my mobility I cannot walk far now, so I’m unable to take part in running challenges any more. 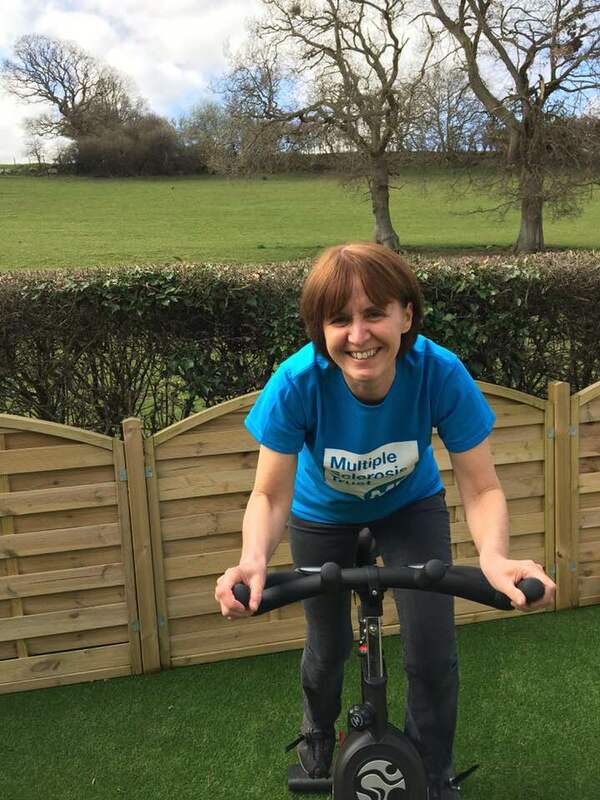 Although I attend weekly yoga and pilates classes, the only cardio-vascular exercise I can do comfortably is on my spinning bike, so I thought I’d put this to good use and raise money for the MS Trust as part of Miles for MS. I have cycled 356 kilometres in total and really enjoyed the challenge and raising money to support people with MS. Exercise on my bike keeps me fit, tones my muscles, helps me to maintain a healthy weight, helps me cope with the challenges of MS, and makes me feel good. My advice to somebody who’s just been diagnosed with MS is to be positive and make your life easier by accepting the aids and help out there. The hardest thing for me was to accept help; like having a blue badge, walking with a walking stick, and using a motor mobility scooter. But I now have all of these and it makes my life so much easier. Thank you to everybody who took part in Miles for MS last year and helped us raise over £43,000!